Jane Jacobs Square, © 2018 Massengale & Co LLC (Bleecker Street, looking south from West 10th Street). City Hall Square, New York, New York. Aerial view looking east towards the Brooklyn Bridge. © 2017 Massengale & Co LLC, Rendering by Gabrielle Stroik Johnson. 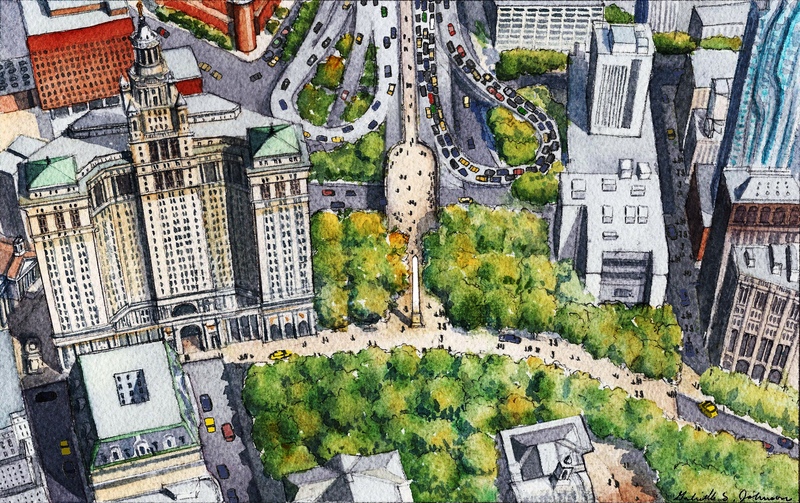 BEFORE: Aerial view looking over City Hall towards Brooklyn Bridge, with the New York Municipal Building on the left. BEFORE: Nassau Street, looking towards Beekman Street and the the Municipal Building. BEFORE: Whitehall Street, looking at the intersection with Broadway, looking south towards Bowling Green. 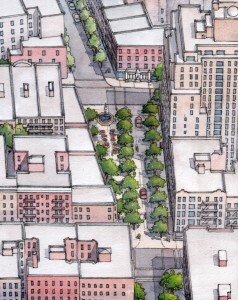 AFTER: Beekman Street redesigned as a Slow Street. © 2017 Massengale & Co LLC, Rendering by Gabriele Stroik Johnson. AFTER: The extension of Bowling Green. © 2017 Massengale & Co LLC, Rendering by Gabriele Stroik Johnson. 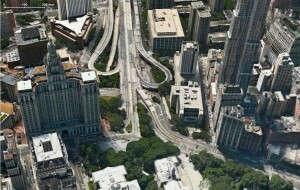 Queens Boulevard, aerial view Before & After. @ 2014 Massengale & Co LLC and UrbanAdvantage, for Transportation Alternatives. 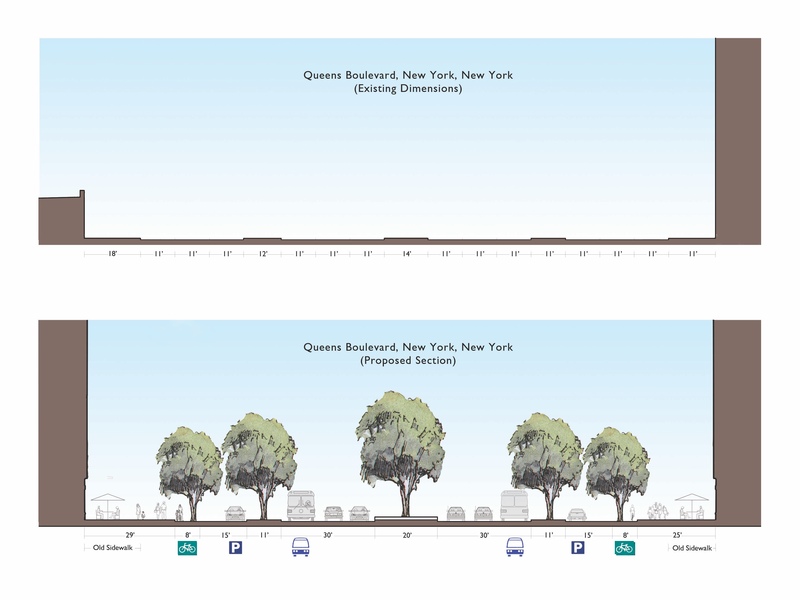 Queens Boulevard, Before & After. On the Queens Boulevard service road between 67th Drive and 68th Avenue. @ 2014 Massengale & Co LLC and UrbanAdvantage, for Transportation Alternatives. AFTER: Queens Boulevard, Queens, New York. Aerial view looking south from 68th Avenue. © 2014 Massengale & Co LLC and UrbanAdvantage, for Transportation Alternatives. 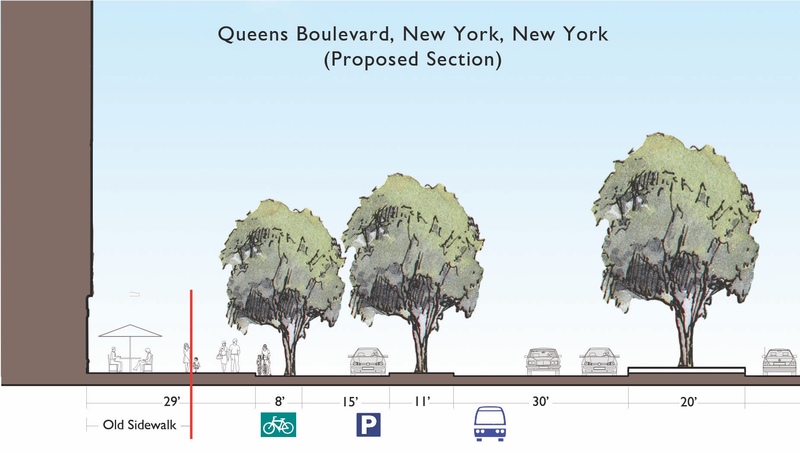 BEFORE: Queens Boulevard, Queens, New York. Aerial view looking south from 68th Avenue. © 2014 Massengale & Col LLC and TransportationAlternatives. AFTER: Queens Boulevard, Queens, New York. Looking south from between 67th Drive and 68th Avenue. © 2014 Massengale & Co LLC and UrbanAdvantage, for Transportation Alternatives. 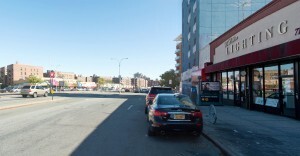 BEFORE: Queens Boulevard, Queens, New York. Looking south from between 67th Drive and 68th Avenue. © 2014 Massengale & Co LLC and Transportation Alternatives. AFTER: Jane Jacobs Square, New York, New York. 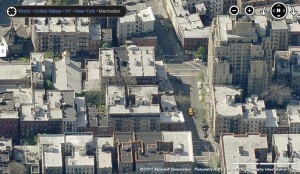 The trapezoidal space, where two old street grids come together, is the historic center of Greenwich Village. It is a few blocks from Jane Jacobs’ former house at 555 Hudson Street. @ 2018 Massengale & Co LLC, Rendering by Gabriele Stroik Johnson. Bleecker Street, looking south from West 10th Street towards Christopher Street, New York, New York. BEFORE: Looking south on Bleecker Street today. 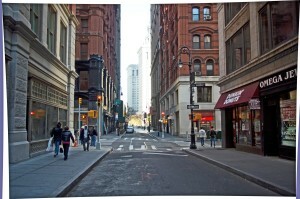 BEFORE: Jane Jacobs Square, New York, New York. An aerial view looking south. © Massengale & Co LLC and Dover, Kohl & Partners, Rendering by James Dougherty. 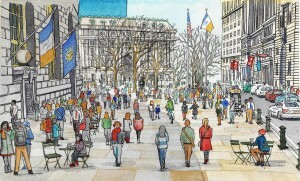 AFTER: Jane Jacobs Square, New York, New York. An aerial view looking south. © Massengale & Co LLC and Dover, Kohl & Partners, Rendering by James Dougherty. AFTER: Yorkville Promenade (After the Second Avenue Subway), New York, New York. Aerial view looking south from 86th Street. © 2014 Massengale & Co LLC and Dover, Kohl & Partners, Rendering by James Dougherty. AFTER: Yorkville Promenade (After the Second Avenue Subway), New York, New York. 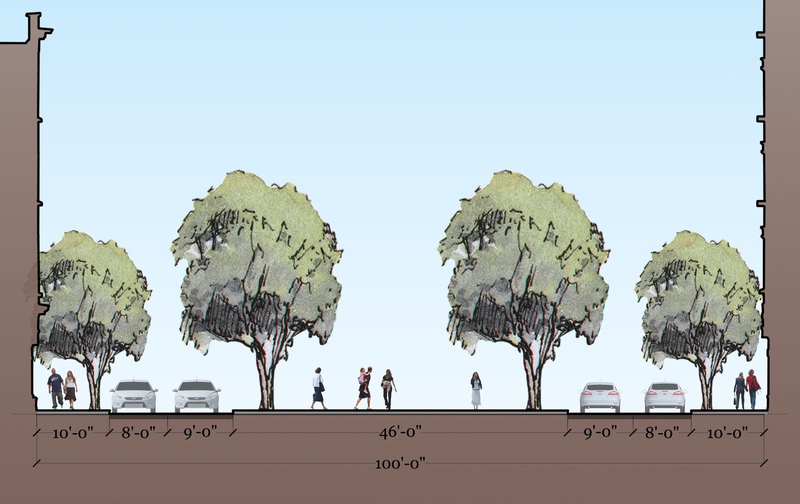 Proposed Section. © 2014 Massengale & Co LLC and Dover, Kohl & Partners. 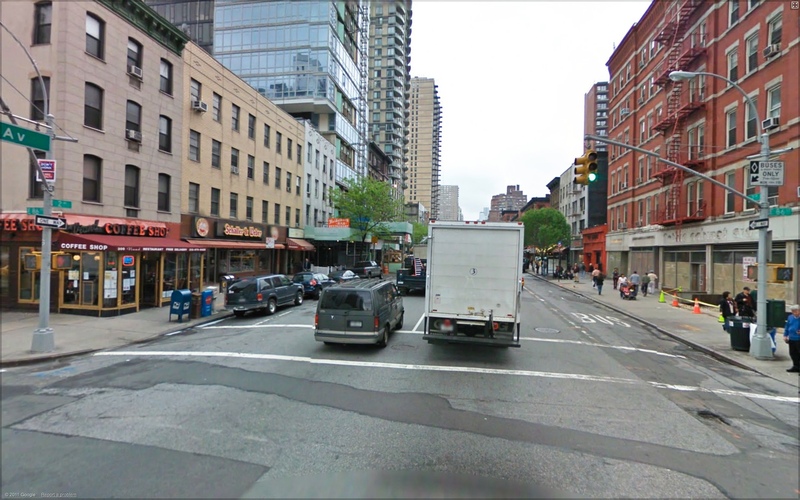 BEFORE: Second Avenue, New York, New York, looking south from 86th Street in 2014. 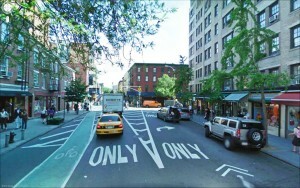 BEFORE: Yorkville Promenade, New York, New York. Aerial view looking south from 86th Street. © 2014 Massengale & Co LLC and Dover, Kohl & Partners, Rendering by James Dougherty. Winslow Homer Walk,, New York, New York. Looking south from 57th Street between Seventh Avenue and Broadway. © 2014 Massengale & Co LLC and Dover, Kohl & Partners, Rendering by James Dougherty. John Massengale, There Are Better Ways to Get Around Town, New York Times, May 15, 2018. 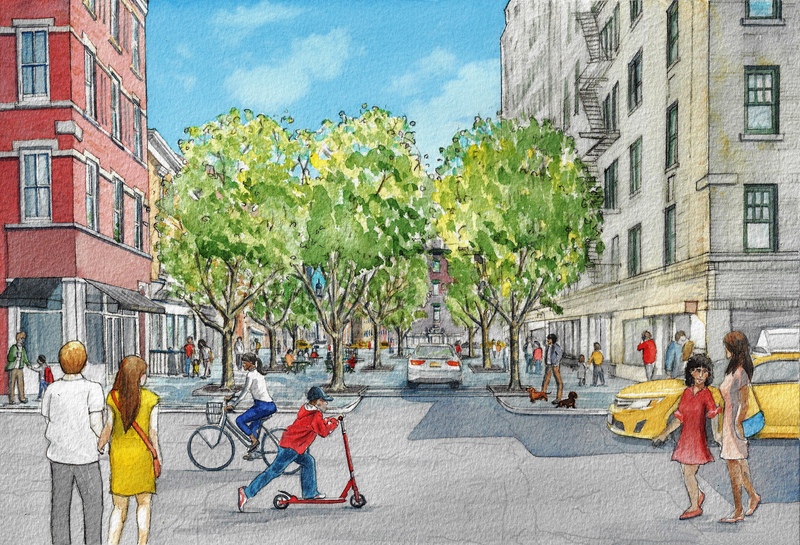 Transportation Alternatives, Streets for New York’s Next Generation, Reclaim, Fall 2014, pp 12–15. 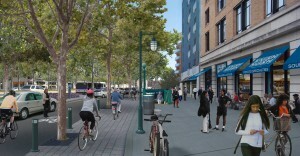 Transportation Alternatives, A New Vision for Queens Boulevard, 2014. John Massengale, Designing Streets for People, Vision Zero Cities, International Journal of Traffic Safety Information, 2017, pp 17–27. John Massengale, A Street Is A Terrible Thing To Waste, New York Council of Mayors Municipal Bulletin, Summer 2014, pp 6–8. 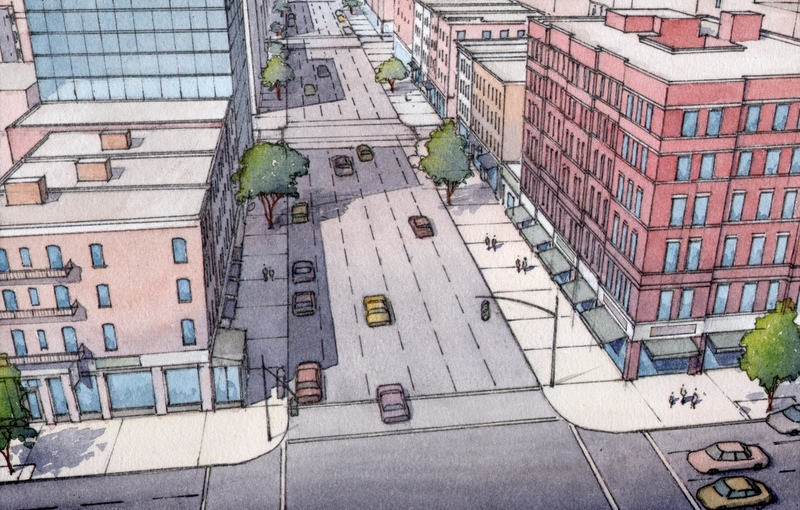 Vincent Barone, Imagine Manhattan’s Financial District embracing a ‘slow streets’ approach, A proposed plan would reduce vehicles’ footprint by stripping parking from most streets in the neighborhood, AM New York, March 12, 2019. Ben Verde, Group Calls for Amsterdamming Most of Lower Manhattan, Streetsblog NYC, Mar 19, 2019. 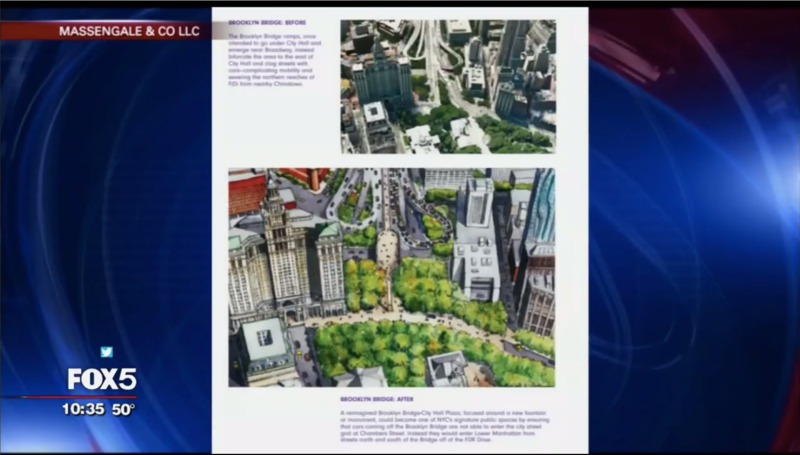 Caroline Spivack, ‘Slow streets’ pilot proposed for the Financial District, 10, Pedestrians and cars would share narrow lower Manhattan streets under the plan, Curbed NY, Mar 19, 2019, 5:30 PM. 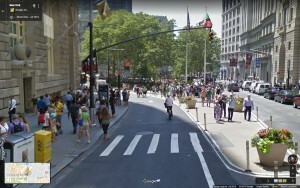 Sydney Pereira, FiDi Group Wants To Open Lower Manhattan Streets To Pedestrians, A neighborhood association is proposing a ‘slow streets’ district in FiDi to allow for pedestrians and cars to share the streets, Patch, March 19, 2019. Rico Burney, Grassroots group calls for ‘shared streets,’ The Villager, April 3, 2019. 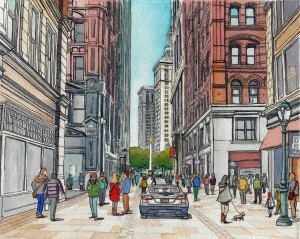 Devin Gannon, Neighborhood association calls for a ‘slow street’ district in FiDi, 6sqft, March 13, 2019. 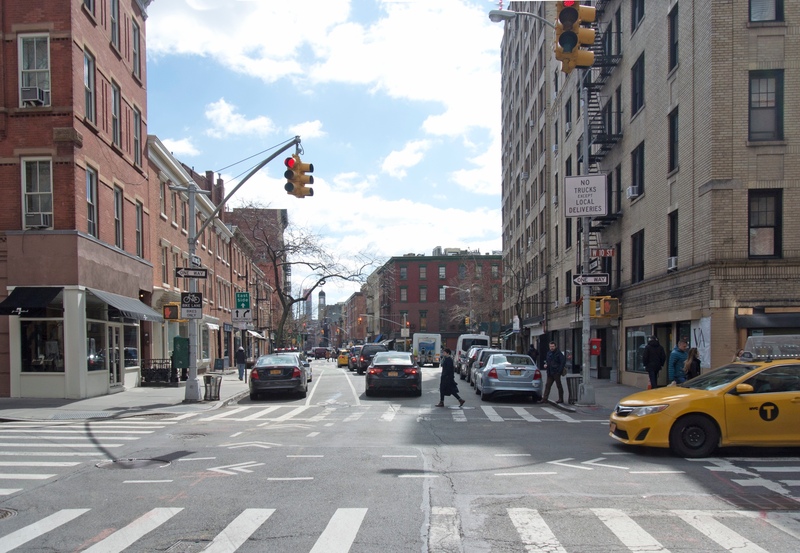 Matthew Fenton, Taking Back the Streets, Local Advocacy Group Seeks to Make Pedestrians King in Lower Manhattan, The Broadsheet, March 27, 2019. 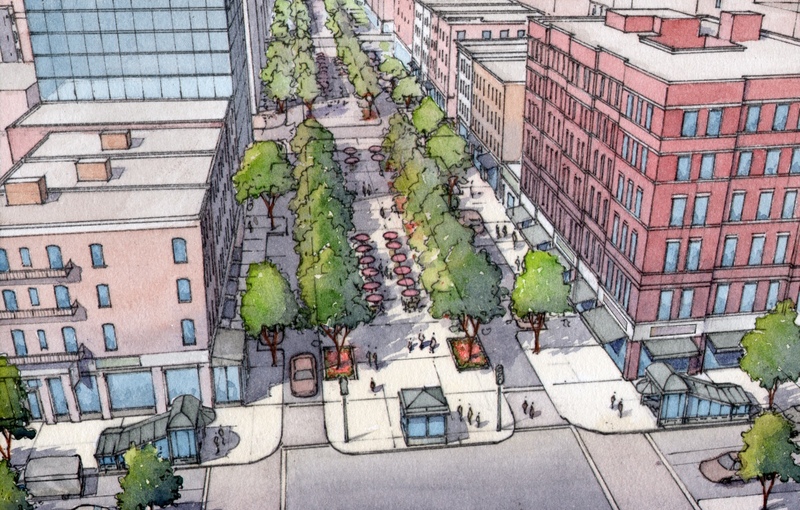 A pedestrian-friendly plan for Fidi, Tribeca Citizen, March 15, 2019. 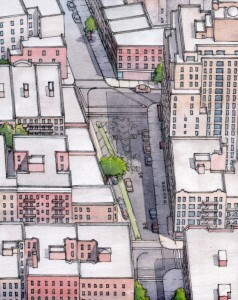 Download the Make Way for Lower Manhattan report from the FDNA website. FOX 5 News, New York, New York.